So this is not a Bolgnese recipe. I’ve recently been tinkering with pasta sauces and in truth there’s nothing you can’t set against a good pasta in terms of a sauce. I have to say though I do not subscribe to the ‘right pasta for the right sauce’ idea – personally I reckon that’s rubbish. Now that might get me dragged through the streets of Naples and locked in the stocks but, hey it’s all going in my face so I ain’t that bothered if the pasta to sauce ratio is outta whack! The anchovie paste is the key to this – it brings a huge richness to the dish and depth of flavour. If you can’t get the paste then use fillets, not as good but close! Kick off by browing down the onions, makes them sweet, then in with the tomato puree and cook out fro a few minutes. If and when this mix gets a little dry then just sling in a little water to lossen things up – you’ll want at least 2 minutes cooking the paste out. 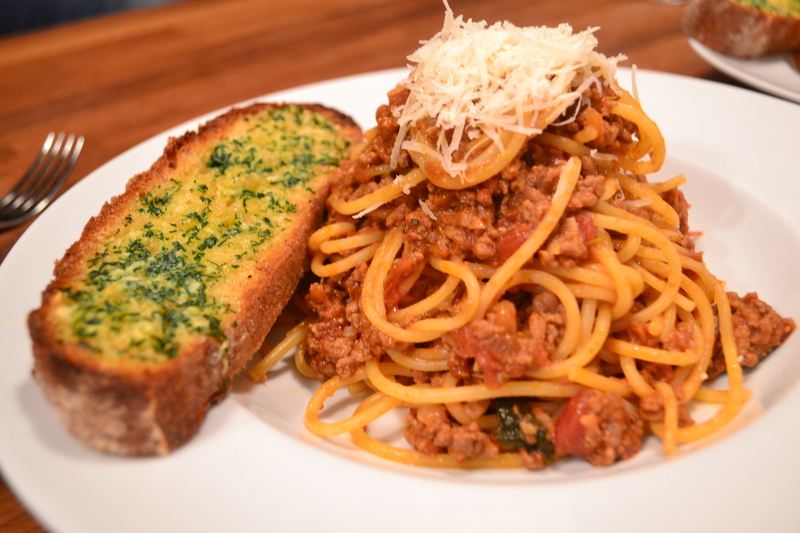 Done deal – serve with sough dough garlic bread and break the big Italian rule – equal quantities of meat sauce and pasta!! Previous Post My Dad’s 10 clove meatballs!